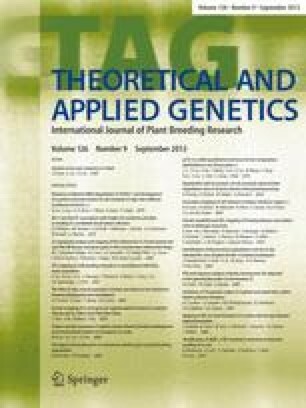 Introgression in Festulolium is a potentially powerful tool to isolate genes for a large number of traits which differ between Festuca pratensis Huds. and Lolium perenne L. Not only are hybrids between the two species fertile, but the two genomes can be distinguished by genomic in situ hybridisation and a high frequency of recombination occurs between homoeologous chromosomes and chromosome segments. By a programme of introgression and a series of backcrosses, L. perenne lines have been produced which contain small F. pratensis substitutions. This material is a rich source of polymorphic markers targeted towards any trait carried on the F. pratensis substitution not observed in the L. perenne background. We describe here the construction of an F. pratensis BAC library, which establishes the basis of a map-based cloning strategy in L. perenne. The library contains 49,152 clones, with an average insert size of 112 kbp, providing coverage of 2.5 haploid genome equivalents. We have screened the library for eight amplified fragment length polymorphism (AFLP) derived markers known to be linked to an F. pratensis gene introgressed into L. perenne and conferring a staygreen phenotype as a consequence of a mutation in primary chlorophyll catabolism. While for four of the markers it was possible to identify bacterial artificial chromosome (BAC) clones, the other four AFLPs were too repetitive to enable reliable identification of locus-specific BACs. Moreover, when the four BACs were partially sequenced, no obvious coding regions could be identified. This contrasted to BACs identified using cDNA sequences, when multiple genes were identified on the same BAC. The Institute of Grassland and Environmental Research (IGER) is sponsored by the UK Biotechnology and Biological Sciences Research Council of the United Kingdom. Iain Donnison is grateful to Pierre Jean Ripoll for helpful advice during BAC library construction. The authors also wish to thank Simon Bright, Mary Knight and Helene Lacroix at Syngenta for the use of their BioPick (BioRobotics) to pick some of the BAC clones. Requests to screen the library should be addressed to Iain Donnison (e-mail: iain.donnison@bbsrc.ac.uk).